When is a guest house not a guest house? When it’s the Guest House next to the New Brunswick Public Library. You may have already guessed (no pun intended) that the house in question actually belonged to someone whose name was Guest. In this case, it was Henry Guest, one of the Hub City’s early prominent citizens. 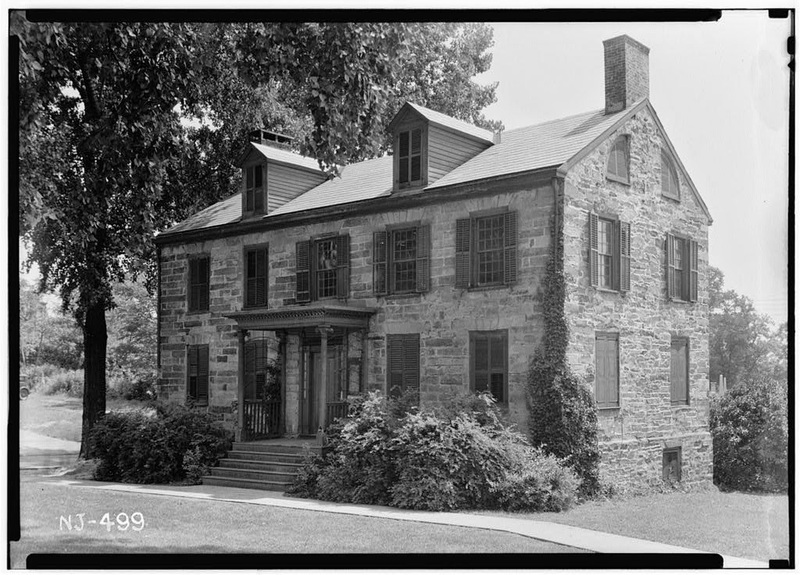 Built in 1760, the 2.5 story, finely-cut stone house originally stood at the corner of Livingston Avenue and Carroll Place (now New Street). A city alderman, Guest seems to have been a very busy man with his hand in diverse industries. The stone for his house is said to have come from his quarry on Burnet Street, and he was also a whaler and tanner who developed new processes for treating leather. 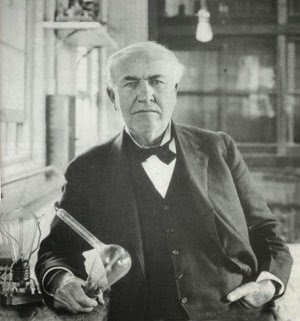 In fact, he claimed before the New York Society of the Arts that his specially-treated hides could be used for roofing in place of copper. Records of his claims against British raids show that he lost a substantial amount of hides and leather shoes to looting or burning in late 1776 or early 1777. The Guest House, however, gets its greatest acclaim, ironically enough, from a guest who may or may not have stayed there for a short period during some of the darkest hours in early American history. Ardent patriots, the Guest family was friendly with notables including future President John Adams and pamphleteer Thomas Paine, and it’s said that Paine hid in the house for a short time in December 1776, as the British were making their charge across New Jersey. You might recall from a previous Hidden New Jersey entry that Paine was, at that point, writing The American Crisis, which inspired patriots when the Revolution seemed all but lost. No existing records indicate the exact dates when Paine was there, but a 1951 New Brunswick Sunday Times article theorizes it may have been early December, just before the city fell to the British. Regardless of whether Paine took refuge there or not, the Guest House can claim some glory as home to Captain Moses Guest, who led the 1779 ambush and capture of Lieutenant Colonel John Graves Simcoe, Loyalist commander of the Queen’s Rangers. Henry Guest reportedly said that if his descendants “would only keep a roof on it, the house would stand till Gabriel blew his trumpet.” However, the house itself very nearly became casualty, not to war, but to 20th century development. In 1925, the Livingston Avenue lot was purchased by the Elks as the site of their New Brunswick lodge. Pharmaceutical titan J. Seward Johnson saved the day, buying the house and offering it to the city, along with $50 in seed money for a fund to finance moving the house to another location and setting it on a new foundation. Today, the Guest House tells its story in an understated fashion, sitting unobtrusively next to the library. Renovations in 1993 brought a new cedar shake roof, woodwork restorations on porch and portico and a new chimney. Under the care of the library administration, the house now hosts community meetings. The name sounds like something out of one of those caricatures about nutty bird watchers: "yes, we saw the crimson-bellied saw whet and the Bohemian waxwing." Thing is, it's a real bird, and at least one, maybe two, have been sighted over the last week or so at Sandy Hook. Normally, this time of year it's somewhere in lower Canada or the northern states of the Midwest or Western U.S. These misguided avian visitors apparently decided a trip to the Jersey Shore was a good way to spend part of the winter. Yes, they spent Washington's birthday weekend at the Sandy Hook that's been totally frozen this winter. According to the many hearty birders who've seen the Bohemian there, it's been very cooperative, happily eating berries from the hollies near the flagpole at the scout camp. Bohemian Waxwing, courtesy Lisa Ann Fanning. A combination of the weather and workload kept Ivan and me from taking a look, until the unusually warm (for this winter, anyway) Sunday of Washington's birthday. Though I'd wanted to hobnob with George and Martha at his headquarters in Morristown I wanted to see the waxwing even more. This beautiful creature, even more distinctive than its dapper cousin who's a New Jersey regular, has been on my "must see" list for quite some time. "Bohemian" brings up thoughts of bongos and smoke-filled Greenwich Village coffeehouses, but this bird eschews the hep cat life for a diet of fruit in the winter, supplemented by insects during the breeding season. The first part of their name comes more from their said nomadic journeys, much like the European Bohemians of old. The "waxwing" part comes from the crimson markings on some of its wing feathers, which makes them appear dipped in red sealing wax. Seeing either waxwing, common though the Cedar waxwings are, is always a treat. 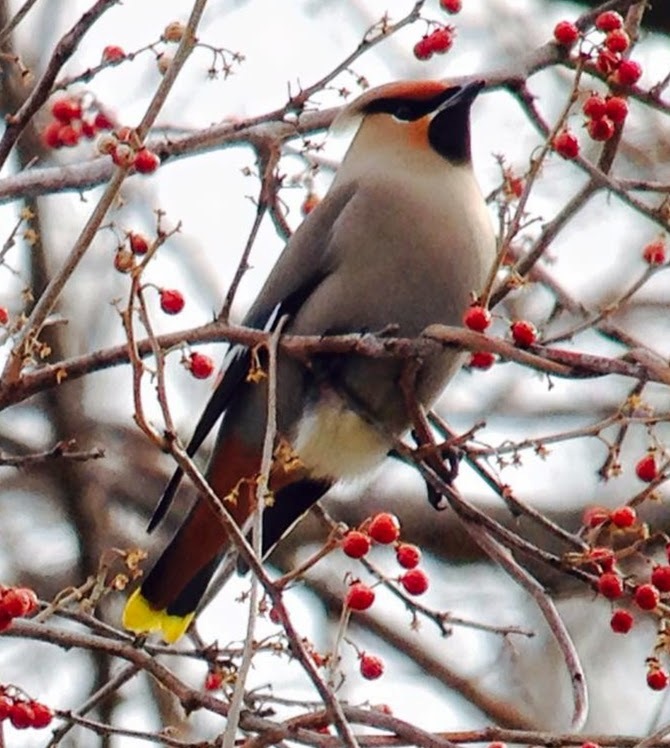 Unlike the usually stark differences evident between feather colors on most birds, the waxwings' bodies appear almost airbrushed, greys evolving into browns, and the yellow of the Cedars' breasts gently transitioning from the brown surrounding it. If your only exposure to one came from a painting, you'd be excused for thinking that something so beautiful couldn't exist in nature. The Bohemian, while still very dignified, is larger and more colorful than the Cedar, making it a "want" not just for my own life list, but because I want the joy of seeing it for myself. Enough that yes, I'd be happy to head to ice-encrusted Sandy Hook to see it. How cold was it? 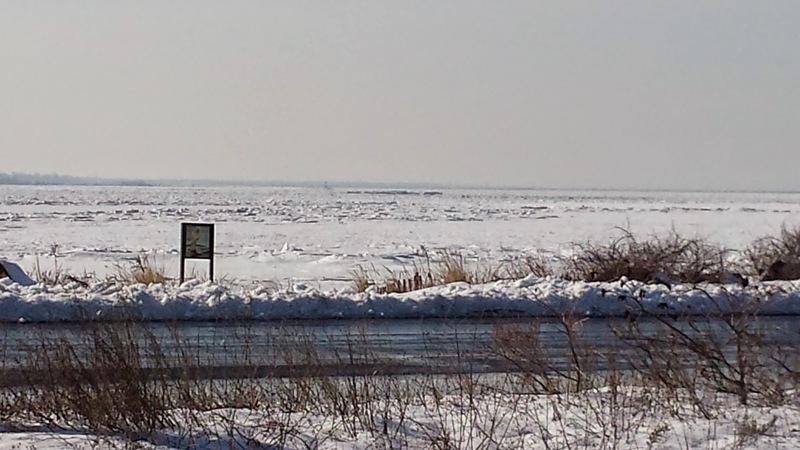 Sandy Hook Bay was frozen. So, off we went, thankful for the 40 degree weather that usually passes for "normal" this time of year in New Jersey. Reports were also that a Vesper sparrow was hanging out near one of the parking lots at the base of the Hook, but the Bohemian was our top priority. We weren't the only ones looking. After stopping at the Nike base on a hunch that a guy with a scope set up had the bird in his sights, we found a scarce spot in the small parking lot near the camp. Other birders returning to their cars said they'd heard the bird was with a flock of robins, but they hadn't seen it. Thus started a couple of hours of wait and see, wander a bit, chat with other birders, and just one sighting of a waxwing of either kind. The hollies at the camp flagpole were still pregnant with berries, but alas, no birds were there to feast on them. Perhaps the waxwing had decamped to a spot deep within Sandy Hook's enormous holly forest, far from the prying eyes of appreciative birders. Wherever it was, we didn't find it. My usual mantra about chase birds once again came true: if it wants me to see it, it will be there. I guess it just wasn't my time. The Vesper sparrow on the other hand, was a bit more cooperative, though barely. Flocking with a bunch of Song sparrows, it finally sat long enough for us to spot it among some weedy grass on the north end of B lot. While it already made my life list just before Hurricane Sandy, they're not always an easy find in New Jersey, so this little guy was a nice consolation. You might notice the name on an exit sign as you drive along the Garden State Parkway: Laurence Harbor. Spelled as it is, in a slighly-unconventional manor, the community's name, for me at least, has always evoked a degree of exclusivity, or maybe just a little hoity, without the toity, so to speak. When I checked The WPA Guide to 1930s New Jersey, I found it described as a "small resort," leading me to wonder whether it had been more along the lines of Keansburg or Deal, Seaside Heights or Avalon. Today, it's part of Old Bridge, and we ended up there a few weeks ago, when our birding exploits found us exploring Raritan Bay via Route 35. It's not exactly the place most people think of when they're looking for interesting gulls and shorebirds, but it's been productive in the past, particularly at South Amboy, whose shoreline is a regular birder hotspot (and a particularly scenic view of Staten Island). Fortunately, Old Bridge seems to be making the most of its shoreline with series of boardwalks in its Waterfront Park. The area was hit hard during Hurricane Sandy but to our eyes the walks and surrounding parkland looked largely (or at least convincingly) restored. Laurence Harbor, back in the day. In certain areas, small bungalow houses were packed tightly together, reminiscent of other shore communities that evolved from summer vacation enclaves to year-round residences. Laurence Harbor, in particular, seemed especially packed, hemmed in on one side by Route 35 and by the edge of a bluff on the other. It's ringed by the one-way, ovular Shoreland Circle, which we were basically forced to take if we had any hope of getting out of the neighborhood. Once we got to the waterfront, we were taken by the views -- it's obvious why someone would want to live on the bay portion of Shoreland, with its modest altitude affording a beautiful perspective. The current residences are the latest iteration of a community created in 1922 by developers who'd bought the storied Laurence Harbor Country Club. Plots of 25 by 100 feet were sold to bungalow dwellers at prices ranging from $75 for the more inland tracts to $500 for shorefront property the boasted panoramic views of Staten Island and the hills of Monmouth County. To complete the seaside atmosphere, summertime residents enjoyed a boardwalk with a merry-go-round, concessions, a dance hall and bandshell. Evolution from summer haven to year-round residences came with the Great Depression of the 1930s, as many owners winterized their weekend houses and lived more cheaply at the Raritan Bayshore. 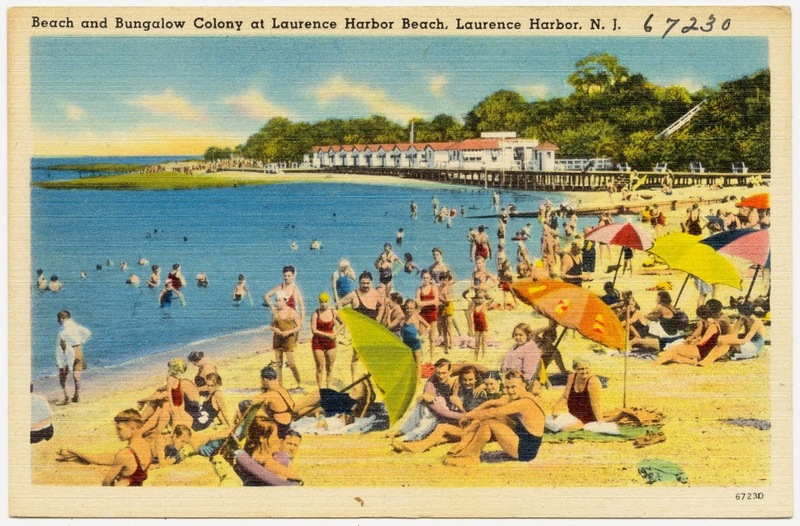 The boardwalk lasted through the 1940s, but a combination of three devastating hurricanes and the construction of the Garden State Parkway in the 1950s spelled the end of Laurence Harbor as a shore resort. North Jersey residents, it seemed, were finding it easier to head farther south to towns along the Atlantic coast, rather than weekending on the bay. Today, that boardwalk is replaced by a new walkway, but with a more natural setting. A portion of the Old Bridge Waterfront Park runs along the Laurence Harbor coast, phragmites blowing in the wind and gulls wheeling overhead. Our visit was curtailed by frigid gusts, but we'll surely be back when the breezes are a bit milder and we can explore a bit more. In New Jersey, as in the other 12 original states, there are plenty of places and things that use the word patriot in their names. Businesses, sports teams, streets, grammar schools -- I'll bet you can easily come up with something in your town that evokes the spirit of the Revolutionary War. Loyalist, well, that's a different story. Go to Canada and you'll find a ton of places, businesses and other entities named to memorialize the folks who stayed true to the Crown during the war (for example, the Loyalist Humane Society offers adoptable cats fit for a queen). In New Jersey, where the battle for independence was also a civil war, it's virtually, if not totally impossible to find evidence of those who didn't at least remain neutral, let alone join the patriot cause, and for good reason. Revolutionaries made life exceedingly hard for many with sympathies for the British cause, seizing their property, jailing many and even resorting to tarring and feathering as a device of humiliation. Some loyalists escaped to British-held New York until the end of the war, while others fled north to the Canadian provinces or to England. When you don't stick around, your descendants don't get much of a chance to tell your story. We've roamed thousands of miles around the state without running into a place that labels itself as a loyalist hot spot. Now we've found one, awaiting restoration next to a new middle school on the outskirts of Clinton. It was home to a family whose men not only sided with the British, but actively fought their neighbors to maintain the status quo. 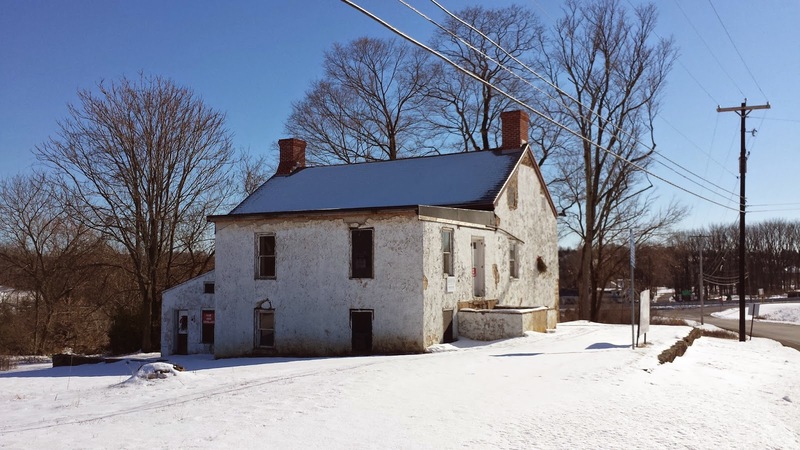 The heavy-timbered wattle-and-daub Vought House was built in 1759 by Christoffel (Stoffel) Vought on a 258 acre farmstead in what was then Lebanon Township. Of German heritage, the family ancestors were part of the exodus from the Palatinate to the New World, traveling first to New York and then to western New Jersey. By the early 1770s, Stoffel had married, established a strong reputation in his community and had transferred ownership of his land and home to his son John. As the Revolution started in 1775, New Jersey's population was substantially loyalist or ambivalent about the idea of independence from Great Britain. It wasn't until the winter of 1776-77 that the state's residents' sympathies began to turn, prompted by the looting, pillaging and physical attacks of British and Hessian troops on civilians. The Voughts, however, started making their mark months earlier, when John reportedly convinced several local men to refuse to serve in the local militia. While the Continental Congress was debating independence 60 miles away in Philadelphia in June 1776, the British were preparing to invade New York City, perhaps a sign to the Voughts that their opportunity had come. Not content to simply affirm his loyalty to Great Britain, John turned violent, leading a band of loyalists in a raid of militia Captain Thomas Jones' tavern, violently setting on the officer, threatening his young family and looting the bar. By the time John Witherspoon and the rest of the New Jersey delegation were signing the Declaration of Independence, both John and Stoffel Vought were in the Hunterdon County jail. In fact, it's quite possible they were there when the Declaration was read on the nearby courthouse steps. Their time behind bars, however, was brief, and six months later, as the British pursued the Continental troops across New Jersey, the Voughts saw another opportunity. As some of their fellow New Jerseyans were actively declaring allegiance to the crown in hopes of keeping their property and avoiding personal injury at the hands of the invading troops, John and Stoffel gathered allies and headed east toward New Brunswick to enlist with the New Jersey Volunteers loyalist troops. This was the start of the Voughts' active attempts to quell the fight for liberty, which ultimately cost them their property, including the house and farmland auctioned in the spring of 1779. John Vought eventually rose to the rank of captain in the Volunteers, an honor that did him and his family little good once the war was over and the British left the newly-formed United States. Finding themselves homeless at the close of the war and their Lebanon Township neighbors unwelcoming to their potential return, they settled in Nova Scotia, where much rockier and less arable land made farming difficult. They finally returned to the U.S. in 1792, taking up residence on land they'd long held in New York State. After being confiscated from the Voughts and sold, the farmstead stayed largely agricultural well into the twentieth century. The house was last occupied by a renter in 2003, until the Clinton Board of Education acquired the property for the construction of a new school. The impending construction attracted the attention of historians and landed the property on Preservation New Jersey's 2010 list of the state's 10 most endangered historic sites, based in part on its role in 18th century events and unique decorative ceiling plaster, including an intriguing serpent design. 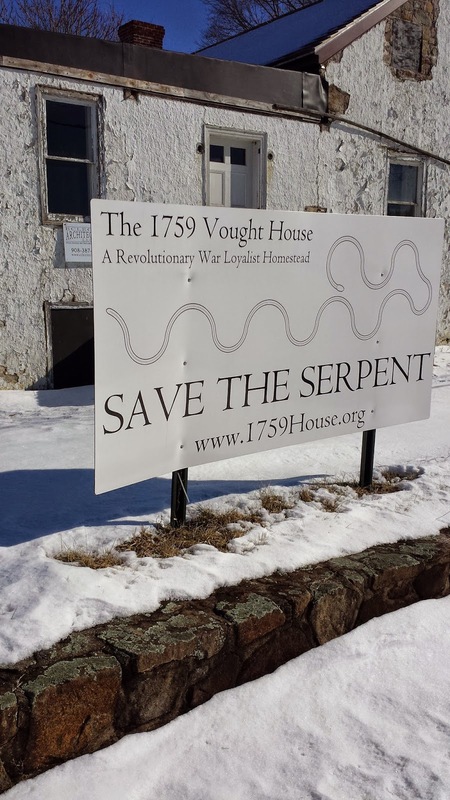 Fortunately, concerned residents created the non-profit 1759 Vought House organization to purchase the house with an eye toward restoration and interpretation to tell New Jersey's complex Loyalist story. The timeline appears long, as with most grassroots preservation projects, but the group has already held several events, including public participation archaeology digs to broaden interest in the effort. I'm personally waiting for a chance to get inside and see the plasterwork, including the serpent featured on the sign advertising the cause in front of the house.